Satin Sheets Cocktail is the first of the Valentine’s Day cocktails we’ve mixed up here at Madtini World Headquarters to celebrate not only Valentine’s Day, a day devoted to love, but also it’s the first of our featured Valentine’s Day cocktails from Madtini’s new book Love Potions: 50 Cupid Approved Cocktails For Valentine’s Day now available at Amazon. 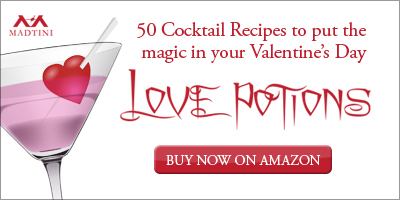 Satin Sheets is in the chapter “On Cloud 9” from Love Potions – a chapter devoted to creamy, dreamy romantic cocktails. 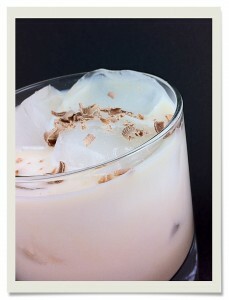 With a mixture of Kahlua, Baileys Irish Cream, Godiva Chocolate liqueur and milk served over ice – this chocolately cocktail is rich and delicious but is surprisingly not as sweet and heavy as you’d imagine. Mix Kahlua, Baileys and chocolate liqueurs into an ice filled old fashioned glass. Add milk to fill the glass. Garnish with shaved chocolate.